Citation: C N Trueman "1945-1950"
By the summer of 1945 Europe was very different to the Europe that had existed at the start of World War Two in September 1939. The Allies (USA, Britain and France) had started to fall out with Stalin’s USSR during the war itself. Stalin had wanted the Allies to start a second front in 1943 to take some of the strain off his forces on the Eastern Front. This, the Allies claimed, was not possible. Stalin got it into his mind that the Allies were deliberately allowing the USSR to take on the might of two-thirds of the Wehrmacht in Eastern Europe. Such a military campaign, he believed, would leave the USSR so weakened once the war was over that the Allies would have major military superiority over the Soviet Union almost immediately hostilities ceased. This distrust also came out in the war conferences that were held during the war. At Casablanca, Yalta and Potsdam, the one thing that clearly united the Allies and the USSR was a common enemy – Nazi Germany. Little else did unite them. In fact, Stalin was not invited to Casablanca which increased his belief that the Allies were planning things behind his back. The Casablanca meeting only concerned the West European front, so there was no need to invite Stalin. However, Stalin interpreted this differently. · The people freed from Nazi rule in Europe should be allowed to set up their own democratic and independent governments. · Germany should be divided into four zones at the end of the war. USA, USSR, GB and France would occupy one zone each. Berlin would also be divided into four sections for the Allies. Half the $20 billions that would be collected from Germany as reparations would go to Russia. · The eastern part of Poland would go to the USSR so that the Soviet Union could build up her defences. Land would be taken from eastern Germany and given to Poland in compensation. · Soviet forces would be used against Japan in the Far East. · A United Nations would be set up to promote world peace. A key issue at Yalta was how to treat those nations that had been under Nazi occupation. It became clear to the Allies, that Stalin’s idea of free and democratic governments was different to theirs. In Stalin’s mind a free and democratic government should be subordinate to Moscow and have pro-Soviet people in power so that those nations would do as Moscow wished. There was little that the Allies could do as the huge Red Army advanced into Eastern Europe towards Berlin. By 1945, the Red Army was a well-equipped and well-led army that had got very used to victory. By May 1945, the month of Nazi Germany’s surrender, the Red Army and therefore Moscow, effectively controlled the bulk of Eastern Europe. Initially, the people of Rumania, Bulgaria and Hungary saw the Red Army as their liberators. But the murder of anti-Moscow political leaders soon tainted their new found freedom. The death of Roosevelt led to Harry Truman becoming American president. He was far less sympathetic to the USSR than Roosevelt had been. He was also president of a country armed with a new and fearsome weapon – the atomic bomb. After the Nazi surrender, the Allies and the USSR met at Potsdam, a suburb of Berlin. They discussed what to do with the newly surrendered Germany. Half-way through the conference, Winston Churchill was replaced with the new British Prime Minister Clement Atlee, the leader of the Labour Party. Despite the celebrations of victory, a number of issues were not fully addressed at Potsdam. There was a failure to re-confirm the promise made at Yalta – of free and independent elections in Eastern Europe. The new border between Poland and Germany was also missed out. Stalin was also told at Potsdam about a new weapon America new possessed. However, very little information was given to him. When the atomic bombs were used on Hiroshima and Nagasaki, it became clear to Stalin that the USSR was years behind America in terms of modern weaponry. Though the Red Army was huge in terms of manpower and its tanks were some of the most modern in the world, this new weapon made all this conventional power of less value. By the end of 1945, the seeds of the Cold War had been well and truly sown. Both sides were no longer linked by a common enemy. One side had massive conventional forces while the other had an unknown number of atomic bombs which could be used against Moscow – as Stalin knew. By the time World War Two ended in the Far East, two very discernible camps had developed: the USA and her allies against the USSR and her enforced allies. Marshall Aid also divided Europe in two – between those nations that accepted US aid and those nations that had it refused on their behalf by Moscow. Stalin simply could not allow what he believed was American influence to seep into those Eastern European nations that were now very much in his control. But two Europe’s developed – one part, the west, that benefitted from US aid and rebuilt accordingly while the eastern sector remained reliant on whatever support the USSR gave it. Between the end of World War Two and the end of 1950, events, particularly in Europe, pushed both Cold War sides to the limit. No actual fighting occurred between the two but the five years set a tone that was continued until the Cold War was formally ended in the 1980’s. One city that seemed to symbolise what the Cold War was all about was Berlin. Stalin had agreed that Berlin should be quartered and divided among the victorious Soviet, American, British and French forces. Each nation had the right to place into their Berlin zones their own troops. Yet Berlin was very much in the Soviet-occupied part of the former Nazi Germany that had been given to her during the Potsdam conference. Here were three nations that had made it as clear as was possible at the time that they did not share the beliefs of the USSR. Yet they had their own troops in Soviet-controlled Germany. It was a situation that Stalin was not willing to tolerate. To supply their troops and staff in their respective Berlin zones, the former war-time allies used either road or rail links that physically crossed Soviet-controlled Germany. In 1948, the major rail and road lines into Berlin were shut for “maintenance”. There was little France, GB or the USA could do other than protest. The three Allied occupied zones in Berlin faced the prospect of being starved out. Stalin simply hoped that the aggravation would be too much for the three nations and they would pull out of Berlin leaving the three zones to the Soviet Union. He was wrong. In 1948 the Berlin Airlift took place to supply the three Allied-controlled Berlin sectors. The USSR had yet to acquire the atomic bomb so it was inconceivable that Stalin would order his air force to shoot down the aircraft bringing supplies into Berlin’s primary airports, especially as they were transport aircraft and unarmed. Stalin had to watch as a vast amount of supplies were unloaded in Berlin and distributed among the civilians who lived in the three Allied-controlled sectors. Defeated, Stalin ordered that the road/rail routes be re-opened into Berlin and the Allies lifted the flights in to the city. It was the first real ‘battle’ in the Cold War and Stalin lost. However, his powerbase in Moscow was far too strong for anyone to take advantage of this. 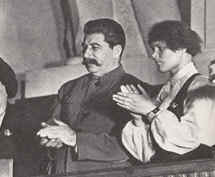 Stalin knew that he could only fight the former Allies on equal terms if he had access to the same weapons as they had. In 1949, this parity occurred. The Soviet Union had breached the security of the US atomic research facility at Los Alamos. The information passed on by the likes of Klaus Fuchs and David Greenglass meant that the Soviet Union exploded her first atomic bomb on August 29th, 1949, thus bringing weapons equality with the USA. It was now that the Cold War took a more dangerous turn as no one in the West knew if Stalin would use such a bomb. There were those in America who had advocated using their atomic bombs against the USSR while the US held the upper hand as a demonstration of its power. But Truman saw no reason to do this. Some in the West did not believe that Stalin would be as seemingly cautious. Once both sides had the atomic bombs, much energy and money was poured into developing the next super weapon – the hydrogen bomb was to dominate the Cold War of the 1950’s onwards. Ostensibly on paper, the USSR had an ally in 1949 when the communists seized power in China under Mao Zedong. To the West this appeared very threatening as two of the world’s largest nations now shared the same political beliefs. We now know that Mao was suspicious of Stalin and the USSR in general and the feeling was mutual in Moscow with regards to Mao and China. However, this was not known at the time. When the Korean War broke out in 1950, it seemed obvious to the West that this was a Moscow/Beijing based plan executed by North Korean communist puppets and one that the West had to respond to.